Every Spring, or at least for the last 3 has included a performance by Gurf Morlix and this year is no different. After being part of our Anniversary shows the past 2 years Gurf returns for a full night of just Gurf. Not to be missed. One of the worlds top songwriters, a rugged and somehow soothing voice and stories to match the songs. A can’t miss. Visiting planet Gurf has always been an enlightening experience. After all, this Gurf Morlix fellow – Buffalo born, Texas bred – has provided us with countless indelible musical moments in the last 40-plus years: his exemplary guitar and production work with Lucinda Williams; his instrumental accompaniment to artists ranging from Blaze Foley to Warren Zevon; his production of watermark albums for artists such as Ray Wylie Hubbard, Robert Earl Keen and Mary Gauthier – and, since 2000, a series of eight solo records that have a singular worldview and can be both harrowing and heartening, often at the same time. Now, prepare yourself for “The Soul And The Heal”. Gurf Morlix’s ninth album is another chapter in a songbook that pithily relates the human condition. 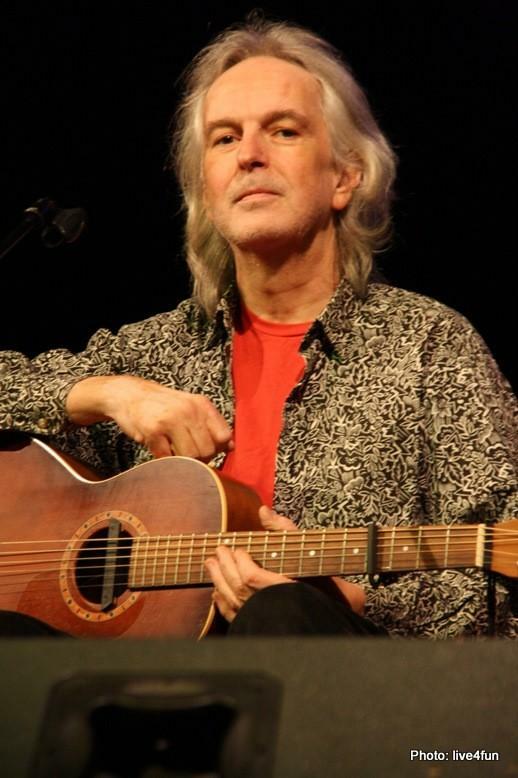 But though Morlix’s signatures are still present on this masterstroke – lyrics that don’t waste a syllable, instrumentation without a spare note – there is also a hopefulness and vulnerability not always readily evident on his recent releases. The fact that “The Soul And The Heal” is pivotal for Gurf is immediately clear from the striking front cover image of a heart-shaped cherry with its pit exposed, and from the stark title that he says speaks to “the healing of the soul from all the damage we inflict on ourselves”. It would be too easy to attribute Gurf’s evolution to the fact that in February 2016 he suffered a heart attack while dead stopped in the fast lane, in a traffic jam, on his way to a gig. In fact these new songs were all written before this episode, from which he has fully recovered. But there’s no doubt the emotions stirred by the unexpected December 2014 passing of Gurf’s musical mate, rock keyboard legend Ian McLagan, contributed to the career pinnacle that “The Soul And The Heal” is for Morlix. The album was recorded at his Rootball home studio. Morlix comes by his musical minimalism naturally: “It’s the way my brain is wired. I like to hear everything clearly.” It’s a solitary sound, different from the sonics he brought to his outside productions – but, as always, it’s anchored by Morlix’s sinewy, expressive guitar. The other constant is drummer Rick Richards – who shares Morlix’s straightforward aesthetic (and whose rhythms Gurf echoes with two foot drums during his almost 100 solo gigs a year). This batch of songs yields the expected Morlix darkness and humor, but woven between are numbers imbued with a warm light. The call to positive action on “Move Someone,” the mindfulness of “Right Now” and the sensitive finale “The Best We Can” balance this focused collection, an album that manages to run the gamut of emotions without being cloying or obvious. With “The Soul And The Heal” Morlix continues to create his own singular musical universe, but the yin and yang of his outlook has never been as in sync as it is now, making it even more inviting to join him on Planet Gurf.